Increasing its exposure to industrial property in the Western Cape, Growthpoint Properties has acquired one of the largest and last remaining unutilised properties in Bellville, Cape Town. 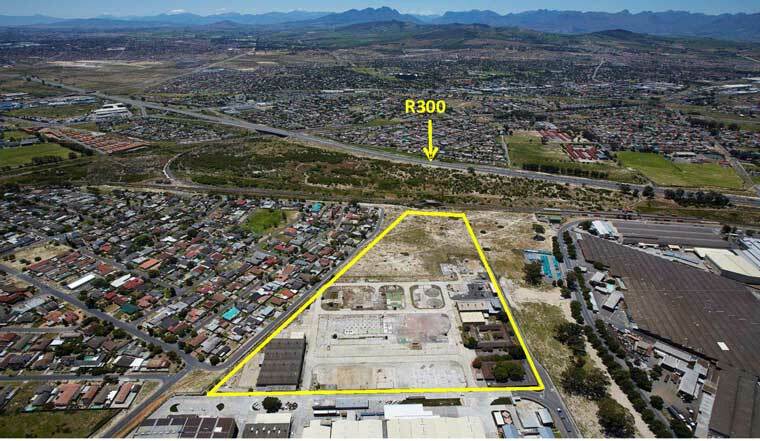 Spanning nearly 8 hectares, the site is prominently positioned adjacent to the well known Sacks Circle industrial site. It was acquired from AECI Sans Fibres and the deal was facilitated by Cape Industrial Properties. The site enjoys an ideal position on Mill Street, near the corner of Robert Sobukwe Road (formerly Modderdam Road) and Peter Barlow Street. It benefits from outstanding visibility on the R300. It also offers easy access to the R300 main arterial which connects to both the N1 and N2 highways. And, for public transport users, it is a short walk from the Bellville Stikland train station. The site also benefits further from the shared security check point with the adjacent Mega Park. Bellville/Stikland is a well established industrial area and home to some of South Africa’s most successful industrial businesses, including Consol Glass, Addis, Nampak, Jon Thompson and Macsteel. From left to right: Joshua van Zyl (Cape Industrial Properties), Riaan Munnik (Growthpoint Development Manager), David Stoll (Growthpoint Regional Head), Johan Foster (Cape Industrial Properties). The development has a General Industrial 1 zoning in place. Importantly, it has the option for two access points for security controlled entrances which offers optimal vehicular circulation and generous yard spaces. “The site provides flexibility to develop premises starting from 5,000 sqm and as large as 40,000 sqm,” says Munnik, who notes that this is a unique opportunity to custom develop a modern, high-spec facility to particular user requirements. Growthpoint has scooped the SAPOA (South African Property Owners Association) Innovative Excellence Industrial Property Development Award for the past two years, and this site will benefit from the Growthpoint team’s award-winning industrial development expertise. This includes energy-efficient development, to help clients contain ongoing operating costs. “Working with our clients, we will deliver customised, quality facilities including energy efficiencies to meet our clients’ needs, with competitive rentals. We’re excited about the unique proposition that this site represents and we are looking forward to developing a high quality facility that will grow our impressive development portfolio for which we have received tremendous accolades,” says Munnik. Growthpoint is the largest South African REIT and a JSE ALSI Top 40 Index company. It owns and manages 393 properties in South Africa, 44 properties in Australia through its investment in GOZ and a 50% interest in the properties at V&A Waterfront, Cape Town.